The unusual gate hinges of Earlsfort Terrace. | Come Here To Me! « Making Money in Dublin 1500-2000. 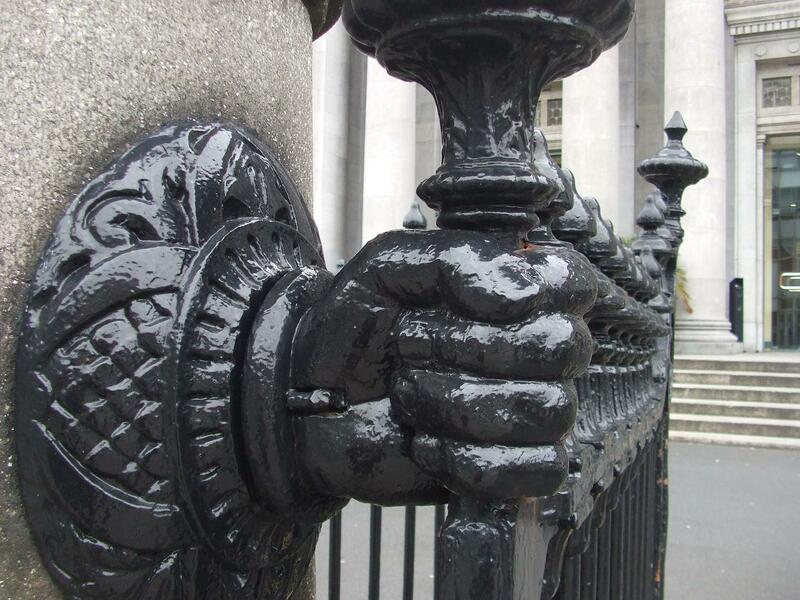 The principal entrance to the building is from Earlsfort-terrace, through six pairs of gates which form a portion of the enclosure wall and chain railing; this runs the entire length of Earlsfort-terrace, for a distance of 250 feet along Hatch-street. Each of the gate entrances has four piers of granite, circular on plan, 3 feet 3 inches at base, 8 feet 6 inches high, and surmounted with a cast-iron lamp-post 7 feet high. 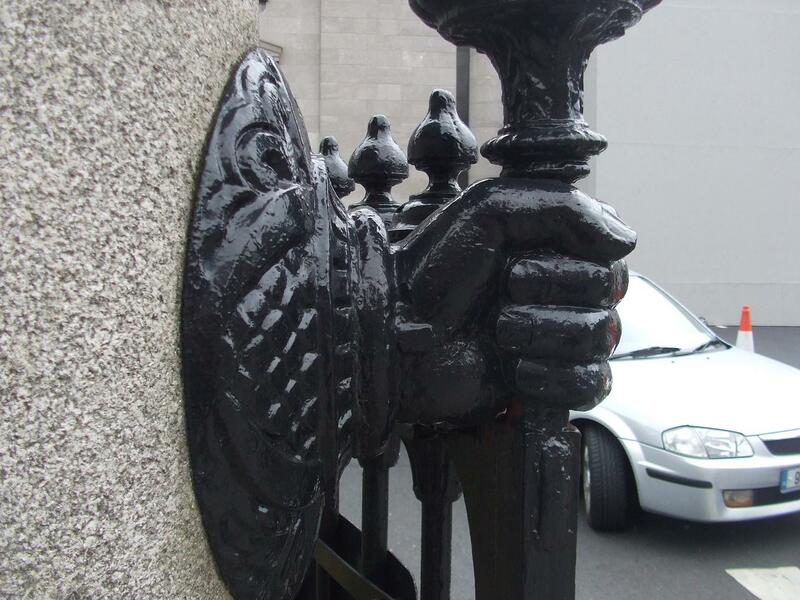 The iron gates are 15 feet wide, and 6 feet high, hung to massive cast iron hands, which are leaded into the stone piers. The source of Jones’ comments is the old reliable Archiseek, who have a great article on the 1865 Dublin exhibition available to read here. I always admire these gates as I pass Earlsfort Terrace, walking or on the bus. Unfortunately the lovely cast iron is marred on the Upper Hatch Street side by an ugly fence addition, which does nothing for the curtilage lines of the site. Yeah… I know the gate hinges well… Have photos somewhere on a camera from before…. They’re amazing hinges…. and the chains, then the gates to the side also, beautiful.